So says Egon von Greyerz (goldswitzerland.com) in edited excerpts from his original article* entitled The lost Century. The world financial system almost collapsed in 2008 but with the help of $25 trillion in printed money, loans and guarantees the world got a temporary stay of execution. [Unfortunately, however,] none of the underlying problems have been solved…and the risks are currently greater than ever. The world has never before been in a situation when most countries are bankrupt and with a financial system which is also insolvent. in just 8 years. Not a mean feat! In total Bernanke has managed to create a total of $12 trillion during his rule which is a 133% increase in total debt including the Fed. These amounts can of course never be repaid in today’s money – never! [As such,] there are only two alternative outcomes, debt default or hyperinflation. Both will have disastrous consequences for the world economy. In addition to the extremely precarious situation in the developed world, we are now seeing a crisis in many Emerging Markets worldwide with falling currencies, bond markets and stock markets. This could easily lead to contagion. A lot has been written about the centenary of the Fed so rather than adding to this, I am showing a couple of graphs that tell the story very well. 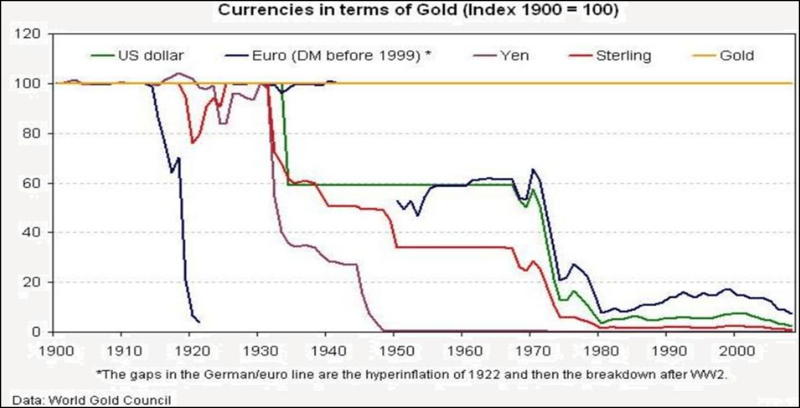 The first chart (courtesy World Gold Council) shows the destruction of paper money since 1913. This is what the Fed and other central banks have achieved. All major currencies have declined between 97% and 99% including the dollar which is down 98% in real terms which of course is measured in gold. As we all know, gold is the only real money and cannot be destroyed. What is absolutely guaranteed is that many currencies, and especially the U.S. dollar, will go down the remaining 2-3% and reach their intrinsic value of ZERO in the next few years. The dollar does not deserve to be the world’s reserve currency and will soon lose that role – and gold will reflect this decline of the dollar and go to heights which are unthinkable today. What Would USD Collapse Mean for the World? The next chart (courtesy Goldman Sachs) shows the total failure of central bank intervention in trying to eliminate peaks and troughs in the economy. 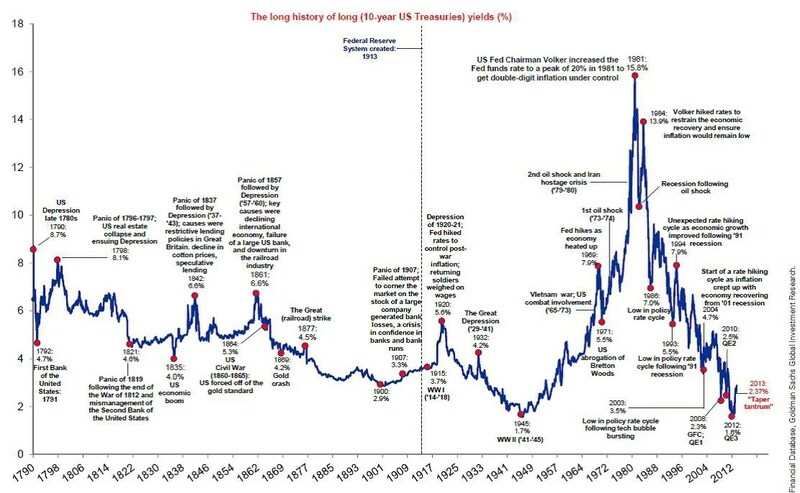 The chart shows 10 year US Treasury yield from 1790 to 2013. Between 1790 and 1913 interest rates fluctuated between 3% and 8% with very few violent swings. Since 1913 we have seen swings in the 10 year rate of incredible proportions going from a low in 1945 of 1.7% to 15.8% in 1981 (with Fed Funds at 20%) and down to 1.6% in 2012. So as the chart shows, rather than eliminating booms and busts, the Fed actually creates them and makes the situation exponentially worse than it would have been in a free market without interference. I would expect rates to reach the 16% level at least in the next few years as investors dump worthless government bonds. The Fed and other central banks have created a time bomb over the last 100 years and any single one of the crisis areas that I have outlined above could be the catalyst to make the world economy implode…They have totally destroyed all major world currencies and left the world with debts that cannot and will not be repaid with normal money. It will lead to misery and famine for a lot of people in the world, and empty stomachs are likely to lead to social unrest in many countries. 2. Where Does U.S. Credit-worthiness Rank Among Other Countries? 4. Why All the Hullabaloo About U.S. Debt? 6. When the Debt Bubble Bursts We’re Going to See Economic Chaos So Get Ready – NOW! 12. A Hypothetical Look At What Could Possibly Be In Store for the U.S.
13. What Would USD Collapse Mean for the World? They will never default as long as they can just go down into the basement and print off a fresh roll. All these other countries that are debasing their own currency to save the US Dollar will be bankrupt before the US is. Really only applies when the market is operating in what I would call “normal situations” and these days we are not in what I would call “normal situations”. Because of the on-going international battle being waged against the continued use of the US$ as the World’s preeminent currency, I believe that the market is now at the mercy of a small group of decision makers which are doing everything they can to WIN, what I refer to as Financial World War I (FWWI). Because of this, I’m suggesting that this is yet another reason to have a percentage of every portfolio invested in physical PM’s, especially since PM’s current values makes buying them painless! With global computer ready to make record numbers of trades nearly instantaneously, by the time small investors learn of any big changes, it is far to late to react in time to protect your own positions, so having some sort of physical backup is just as important for your portfolio as it is for your computer records!